While seasonal allergies don’t usually pose much of a threat to the everyday health of people with allergies, they can be annoying and debilitating enough to impact quality of life. For those who live in humid climates, heat and moisture can multiply the effects of pollen, dust mites and other common allergens to cause serious disruptions to everyday life. However, relief exists in the form of appliances that remove moisture from the air. With a luxury dehumidifier from Designer Appliances, homes in even the most balmy climates can be made safe and comfortable for people with allergies. As anybody who lives with allergies knows, the spring and summer months can be difficult without proper medication. Even then, over-the-counter remedies and prescriptions from physicians can result in drowsiness and other side effects, but people with allergies sometimes have no other choice as their symptoms worsen in higher temperatures. The American College of Allergy, Asthma and Immunology explained that dust mites, a common, microscopic creature that reacts with dust to cause allergic reactions in most people, thrive at temperatures above 70 degrees and relative humidity levels around 75 or 80 percent. Because they are so small, as many as 500 mites can live within a single gram of dust. Rarely found in arid climates such as the Southwest, dust mites cannot survive in lower humidity levels. The ACAAI also outlined the increased risk of mold in humid climates. When an area’s humidity rises above 50 percent and any type of moisture such as leaky pipes or an extended period of rain is present, mold can grow on virtually any surface. Once mold has the chance to grow, it produces airborne spores that enter deposits of dust around the house and can incite an allergic reaction in humans. If a mold problem grows severe enough, it can cause serious damage to a home’s value as well. 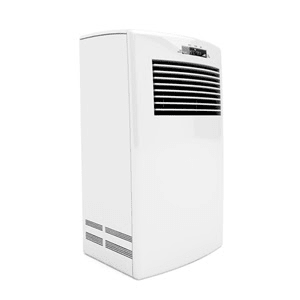 While dust mites and mold may pose threats to anyone living in a humid climate, a luxury dehumidifier that lowers the relative humidity within your home can essentially remove any irritants. How Stuff Works outlined the steps that a deluxe dehumidifier takes to remove harmful moisture from your home. A fan pulls the surrounding air into the cooling coils that run at a much colder temperature than the air in your home. After the moisture in the air automatically condenses onto the coils, it then drips down into a bin within the dehumidifier that can either be emptied manually or hooked up via hose or other system to automatically remove the condensed water. With the latter method, a dehumidifier can run constantly without your attention, while the manual removal method necessitates periodic removal of the collected water. Whichever removal system you prefer, you’ll be amazed at the amount of moisture a quality dehumidifier pulls from the air in your home. Higher humidity levels can create the perfect storm of allergens in your home, but the right equipment can ensure that you always feel comfortable.